Bookshelves are for more than just books and should have photos and personal items. Almost every home has at least one if not several bookshelves. From den to bedroom to bathroom, bookshelves are an important part of our homes. But, unlike its name, they are not just for books. 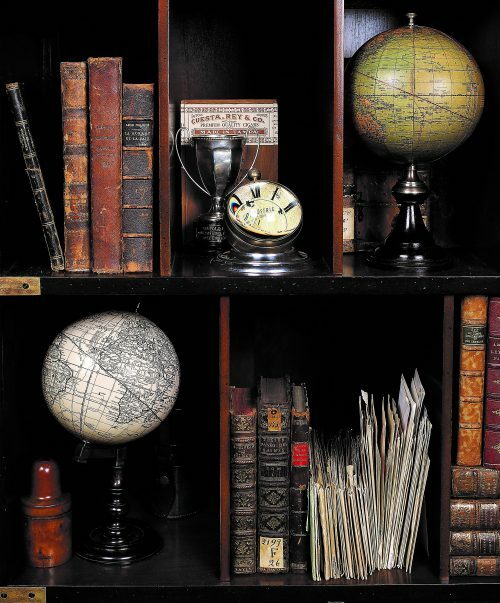 In fact, decorating bookshelves is a fun way to give a room some personality. And what better time than back-to-school to organize your space. My wife loves bookshelves and is always bringing another home from a yard sale, so decorating them is quite a challenge. Here are some decorating tips I have learned from professional interior designers. First, bookshelves should have books. But, instead of lining them up vertically, try turning some horizontally. Interior decorators recommend using an odd number to add visual interest. Next add some accessories to give the shelves added depth. Van Dyke’s also offers a nice selection of thermometers and clocks. A personalized plaque with your family name makes the space personal along with some family photos and pictures. Plaques come in several sizes and styles for just the right look. 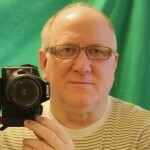 Mirrors are another popular choice when decorating and add visual interest. Mirrors also make a smaller space look bigger. Shelves are great in a closet for organizing clothing, shoes, and accessories. A mudroom or entry is another popular location for shelves to keep school supplies, clothing, and weather gear handy. Shelves in the laundry keep detergent and other items readily accessible. The garage is another area where shelving units keep yard tools, outdoor items, and sports equipment out of the way. While adding items to the shelves, don’t neglect the shelf itself. Van Dyke’s offers one of the ind ustry’s largest selections of corbels and shelf brackets in many sizes and design styles from Victorian to Contemporary. Corbels are both decorative and highly functional adding strength and support. 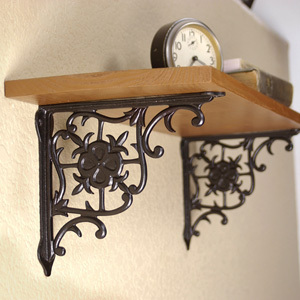 Metal shelf brackets also come in many styles a nd give a vintage appeal. Van Dyke’s has cast iron shelf brackets as well as heavy-duty brackets for supporting the heaviest shelves. If your bookshelf covers an entire wall, a library ladder is not only a necessity, but will bring a sophisticated look to the space. 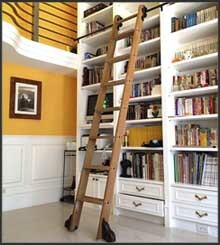 Van Dyke’s has the Quiet Glide Library Ladder hardware kits and accessories to build your own ladder. Check out our blog on these amazing ladders. 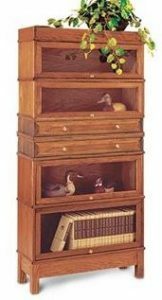 Van Dyke’s also offers the stylish Barrister Bookcase Kit in red oak that is a must have for your study or library. These units can be stacked to create a beautiful wall piece and are easy to assemble.